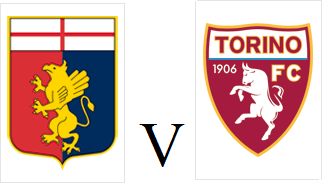 Torino will aim to win back-to-back games for the first time this season as they travel to Genoa on Saturday evening. The Granata will be without Danilo D'Ambrosio who is suspended, whilst Kamil Glik, Matteo Brighi and Alessandro Gazzi are all hoping to be recalled. Striker Ciro Immobile has been in excellent form in recent weeks, having scored five goals in his last seven appearances and he will be looking to continue those exploits against his former side. Genoa have been in good form themselves in recent weeks, having won three of their last four matches, and only conceding one goal in the process. However, a victory for Toro will move them above il Grifone in the league table. Torino secured their first victory since the end of September after a convincing 4-1 victory over Catania at the Stadio Olimpico on Sunday. Giampiero Ventura decided to keep faith with goalkeeper Danielle Padelli, whilst captain Kamil Glik was again left on the bench with Cesare Bovo being preferred. In midfield, Alexander Farnerud and Migjen Basha were surprise selections, whilst Omar El Kaddouri, Ciro Immobile and Alessio Cerci formed an exciting trio in attack. An excellent turn and shot from Ciro Immobile almost gave Toro a lead within the opening couple of minutes, but he was denied by Mariano Andujar. From the resulting corner, Immobile hit the bar with a header, and then Emiliano Moretti somehow volleyed over from close range. However, Torino deservedly went ahead in the tenth minute after former Juventus defender Nicola Legrottaglie somehow lost his footing, and that allowed Immobile to go through on goal before calmly finishing past Andujar. The former Genoa striker was having an enjoyable afternoon, and he should have doubled Toro's lead when he received an excellent through ball from Omar El Kaddouri, and then rounded the goalkeeper - but he was unable to finish from a difficult angle. But Toro were able to double their advantage sixty seconds later, when a mistimed interception by Tiberio Guarente set the ball up perfectly for El Kaddouri, and the Moroccan international scored his first goal for the club with ease. The away side got a goal back five minutes after the break when substitute Sebastian Leto's left footed shot looped over Padelli and into the net. The Granata were particularly upset at this goal, as they felt they should have been awarded a penalty moments earlier when Jaroslav Plašil fouled El Kaddouri in the area. However, Torino re-established their two goal advantage ten minutes later when Alessio Cerci's corner was glanced home by the veteran defender Emiliano Moretti. And two minutes later the result was put beyond any doubt when El Kaddouri scored his second goal of the game after Immobile's initial shot was saved. Toro had opportunities to make the scoreline more impressive, but top scorer Alessio Cerci twice decided to go for goal himself despite the fact a simple pass would have given a team mate a simple tap in. This was a much needed result for Torino, and will hopefully kick start a season that had began in impressive fashion. Toro's next two fixtures against Genoa and Lazio are both winnable games, and positive results in those fixtures could alter the narrative of Toro's campaign dramatically. 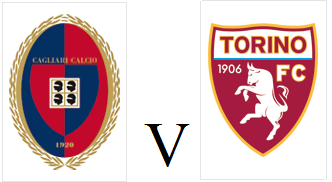 After dwelling on their last minute defeat against Cagliari for two weeks, Torino are back in action at home to Catania on Sunday afternoon. The Granata have not won in eight matches, and despite a promising start to the season could quickly become embroiled in yet another relegation battle. Alexander Farnerud has returned to the squad after injury, whilst Daniele Padelli's position as number one could be in jeopardy after making a number of mistakes in recent weeks. Opponents Catania have had a poor start to the season, especially in comparison to their impressive campaign last season. Gli Elefanti are currently in the bottom three, and have been extremely poor on the road - losing all six of their away games this season. For the second consecutive season, an injury time winner from Daniele Conti denied Torino a deserved point against Cagliari. Giampiero Ventura surprisingly left club captain Kamil Glik on the bench, as Toro lined up in a 4-3-3 formation with Cesare Bovo and Emiliano Moretti as the two centre backs. Striker Ciro Immobile also returned to the starting eleven, as did Matteo Brighi. Torino had a number of chances to take the lead in the first half, with Alessio Cerci forcing Vlad Avramov into a couple of saves. However, on the stroke of half time it was the home side who took the lead via Daniele Conti's free kick. After dominating the opening period the Granata were disappointed to concede a goal in that fashion, and both the Torino wall and Daniele Padelli will feel they could have done more to prevent it. However, seven minutes into the second half Ciro Immobile scored a deserved equaliser for Torino, as he expertly controlled Omar El Kaddouri's through ball before sliding the ball into the bottom corner. Immobile almost gave Toro the lead in sensational fashion moment later, however his speculative volley flew over the bar. And with only one minute of normal time remaining, Daniele Conti struck with a set piece once again, as he fired the ball past Padelli for the second time, this time having been set up by substitute Andrea Cossu. After being the better side for much of the game, and seemingly being happy to settle for a deserved point away from home, to end up with nothing was a bitter pill to swallow for the Granata. For the first time this season, serious questions are being asked regarding Daniele Padelli's position as number 1, and a number of fans (myself included) would like to see Lys Gomis given an opportunity to stake his claim in the first team. With the international break coming up next week, Toro will not play again for the fortnight - when they face Catania at home. Although it is still very early in the season, this game could already be placed in the 'must win' category, as Toro look to end a run of eight games without a win. After becoming the first team to take a point off of league leaders Roma, Torino travel to Sardinia in search of their first victory since September. Torino's injury problems continue, and they will be without both Giovanni Pasquale and Paulo Barreto, although the inclusion of Cesare Bovo in the squad could mean that Toro return to a three man defence. Cagliari have been in poor form recently, and have lost their last three fixtures and they will be hoping for a repeat of last season's match between the two sides. The RossoBlu beat nine-man Torino 4-3 after scoring a late winner deep in injury time, moments after Rolando Bianchi had equalised from the spot. After winning their opening ten Serie A fixtures, Roma's record-breaking start to the season came to an end on Sunday evening after a 1-1 draw with Torino. Giampiero Ventura surprisingly reverted to a 4-2-4 formation that was their trademark for the majority of last season. Ciro Immobile was dropped to the bench, as Riccardo Meggiorini and Paulo Barreto started up front, whilst Migjen Basha returned from suspension in midfield. The league leaders almost took an early lead after a spectacular volley from Alessandro Florenzi from the edge of the area, but the ball sailed over the bar. However, on the half hour mark Roma did take the lead, when Alessio Cerci fell asleep from a short corner, which allowed Miralem Pjanic the room to cross for Kevin Strootman, who scored from close range. However, Torino's star man Cerci set about trying to make amends for that error as his curling shot forced Morgan De Sanctis into an excellent save. On the stroke of half time, another brilliant run from the former Roma winger gave Omar El Kaddouri an opportunity, but his shot was disappointing. The Granata almost equalised in sensational fashion, when Migjen Basha's diagonal ball was met with an exquisite left footed volley by Riccardo Meggiorini, but once again the home side were denied by De Sanctis. However, with just over an hour on the clock, Torino got a deserved equalised after the usually reliable Medhi Benatia was dispossessed by Meggiorini, and the former Bari striker kept calm to roll the ball across goal and give Alessio Cerci a tap in. Incredibly, that was only the second goal that Roma have conceded so far this season. Roma struggled to create clear cut chances after conceding the equaliser, and they were unable to prolong their perfect start to the season, despite substitute Adem Ljajic hitting the target with a late free kick. This was a fine performance from Torino, and they deservedly came out of the game with a point. However, it must be said that they were somewhat fortunate to face a Roma side without both Francesco Totti and Gervinho - arguably their two best players this season. However, it was an impressive achievement to be the team to break Roma's winning run, however the fact that this result also extended Toro's own run without a win to seven games continues to be a worry. 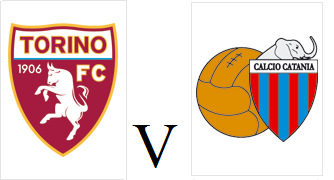 After the dramatic events of Wednesday's 3-3 draw against Livorno, the Granata face another tough challenge as league leaders Roma visit the Olimpico. Torino have a lengthy list of absentees, and Guillermo Rodriguez, Alexander Farnerud and Marcelo Larrondo will all miss this game. However, former Roma midfielder Matteo Brighi returns to the squad, whilst Cesare Bovo has also returned from injury. League leaders Roma have been re-writing the record books as they have opened the season with an incredible ten wins out of ten. But coach Rudi Garcia also has selection issues, with Gervinho and Francesco Totti both missing out due to injury. 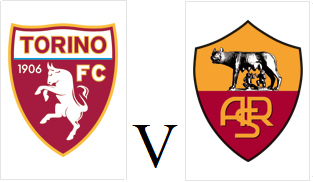 Centre back Leandro Castan is also suspended, so Nicolas Burdisso is expected to deputise - and it remains to be seen whether this slight change could cause disruption to a back four that has only conceded one goal this season.